A Blog with no readership equals a body with no soul. Nothing matters more at least for me than readers who read, share and circulate the content. So please support my blog. 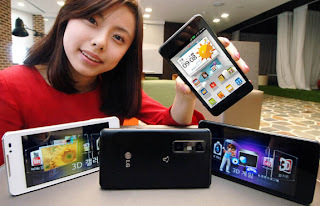 Optimus 3D second-generation rumors for a long time has finally officially released, Part VI LG's new phone over the past few days. Main uncorrected visual acuity of 3D features Optimus 3D, the Cube has a larger 4.3-inch screen, giving the viewer a broader 3D visual enjoyment. Specifications, it is compared to the previous generation has improved, equipped with a faster 1.2GHz dual-core processors, larger capacity 1520mAh battery, thinner 9.6mm fuselage design, the amount of RAM upgraded to 1GB also built the NFC transmission technology, corresponding to the Tag + function. But set the two lenses are still 5 million pixels, support 1080p 3D film, mainly a 3D video editing functions. The LG the Optimus 3D the Cube first South Korean telecommunications provider SK Telecom first in the next month on sale, priced at 847,000 won, about HK $ 5,839 is loaded with the launch of the Android 2.3 system, no official Android 4.0 upgrade schedule. Techirks 2011. Simple theme. Powered by Blogger.